The last stop of our Caribbean cruise was Sint Maarten/ Saint Martin. The pronunciation changes, depending on which half of the island you are. After all, one side belongs to the French, while the other is Dutch. On the Dutch side, the sockets are American, on the French, they are European. In addition, the currents differ and you can pay with dollars or euros. There is an anecdote about the partition of the island: After the possession of the isle had changed for years between the French and Dutch (sometimes the English), people decided to divide the island in 1816. Legend has it, that French and Dutch met and held a race. From Boundary Point, one settler of each country raced in opposite direction along the coast line. The border should be drawn, where the two would meet again. The Frenchman got wine as provisions, the Dutchman took schnapps on his trip. Thus, the Frenchman was not as drunk as the Dutch and could run faster. That’s the reason why the French side is bigger. 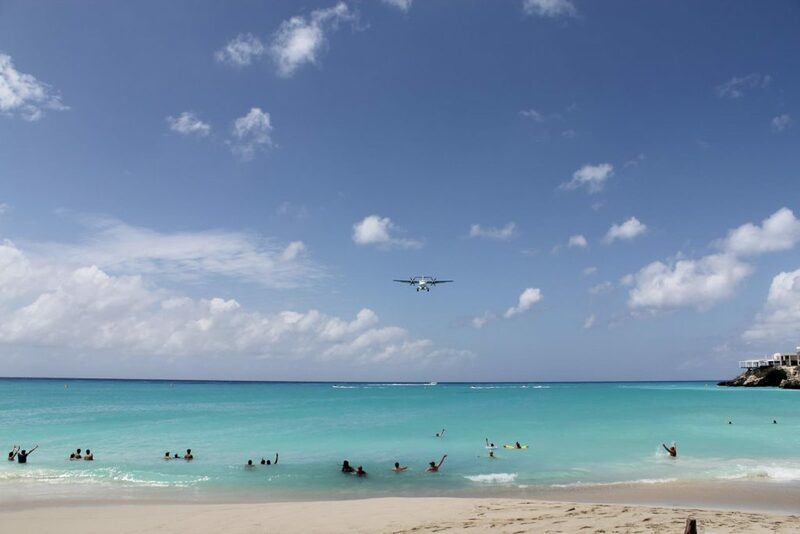 The island’s most famous attraction is definitely Maho Beach. This beach is located in the approach lane of Princess Juliana Airport and the planes land and launch only a few meters above your head. Before Hurricane Irma, aircraft as bis as the Boeing 737 landed here. In 2017, a human being had even been fatally injured while plane-watching. The woman was thrown against a concrete block by the wind of a launching aircraft. However, since the island is busy with reconstruction, hardly any big planes arrive at the airport anymore. Sint Maarten/ Saint Martin was heavily devastated in late fall 2017 by the most disastrous Atlantic hurricane ever recorded. The storm has left three billion USD worth of damage. Boats, ships and yachts are still scattered ashore or have sunk. Innumerable hotels are in ruins, houses have vanished and you see smaller planes lying upside down on the side of the road. A cargo ship was even pushed into a bay and on top, the wind filled it with sand – unbelievable! Incidentally, there are some pictures of the damage in the galleries. At the left edge of the screen you can zoom in and out, as usual. Nevertheless, the Caribbean island is under construction and getting better. More and more hotels are welcoming guests and cruise ships are docking again. Thus, the tourists and largest source of income are back on the island. On good days, by the way, ten such ships arrive. Since Sint Maarten is the only duty-free port in the Caribbean, you can buy tobacco and alcohol very cheap. This alone has formed a kind of intoxicant tourism to the island. By the way: electrical appliances, diamonds and gold are also cheap. The lifestyle of the islanders is unusual. Although there is a border between the two states, it is only shown on monuments and must never be closed, no matter what happens on mainland. After all, the two sides can not exist without each other. One supplies the other with electricity and gets drinking water in exchange. Apart from that, you notice the different currency and the style of houses, once you have crossed the border. In addition, a telephone conversation from one side to the other is an international call. There are also no casinos on the French side but nine on the Dutch. In return, there is a well-known nudist beach on the French side: the Orient Beach. This is the picture with the yellow umbrellas. For this photo, I almost got lynched, as I did not realize I was on a nudist beach. The hotel manager did not really buy that from me. After our last day on the Caribbean-cruise, we arrived in San Juan, Puerto Rico the next morning. For our next stop, we spend a week in Miami. I’ll report in the next post, but this was not as cool as you might think!